Are u a surfer or maybe a windsurfer? Looking for amazing waves and great winds? All of these you may find in Cabo Verde. Surf Vista's goal is pretty simple - we give you everything you need to ride the wave. We give you perfect rigs and other equipment you may need. Boa Vista is the place not just for professionals, those who seek for their first place to ride the waves are welcome any day, any time. Cape Verde in really magnificent place. We offer you lessons in attractive price, just 59 for your first hour. More lessons means less costs. The choice is simple then. We also offer equipment rental, so you don't have to worry about bringing boards with you. Proffesional or amateur? If you need just an equipment, we have everything you may need. If you want to conquer the ocean for the first time, we offer lessons just for you. There are really amazing waves in Cabo Verde, that's why you do not need to worry about weather conditions. Find Surf Vista in northern Cabo Verde and start being a windsurfer. Windsurfing is for everyone! Have you ever wondered if you are capable to ride a kite surfboad? If your answer is yes, there is an amazing news for you. You can check this out in Cabo Verde. We will help you to take your first, important steps and give you directions what should you do, to do it perfectly. Kitesurfing is really popular activity on our amazing island, so you will be able to find new mates and people fresh like you. Or - if you've got a lot of experience, we can offer you professional equipment to rent. Explore the island. Ride epic wave. Imporve your kitesurfing skills. Taste local food. 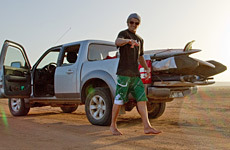 Get into culture of Boa Vista island. 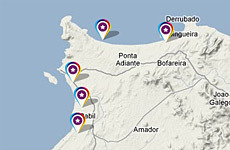 We are located in front of all main hotels of Boa Vista Island. We offer kite and windsurf lessons, gear rent and storage. Check out how the conditions looks like on our main spot in front of RIU Karmboa hotel close to Sal Rei town. 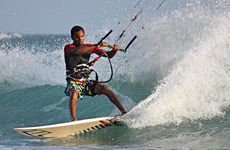 Boa Vista offers some of the best down the line wave sailing around Cabo Verde islands.